Reykjavik transport hub Hlemmur has been resurrected, reborn into the role it was always meant to assume; that of an indoor market, an essential feature in a city where outdoor activities are infeasible for most of the year. Architect Gunnar Hansson’s distinctive building, once one of Reykjavík’s best-known meeting places for punks and misfits, has undergone renovation and is now a popular food hall, a place where a broad variety of both fresh and prepared food can be found and purchased. Hlemmur square, located in the eastern corner of central Reykjavik, has a long and colourful history. The year 1904 saw the construction of a new house on the lot by 125 Hverfisgata, a house affectionately known as the North Pole (Norðurpóllinn). Food was sold there, mostly to travellers passing through. At the time, the area around Hlemmur was considered the city’s eastern limits, with only a scant few houses standing further east. Travellers to and from the city were consequently frequent visitors, and Hlemmur was also a waystation on the road to the hot pools of Laugardalur, where locals went to wash their clothes. Hlemmur was therefore already a crucial link in Reykjavik’s transport system before the dawn of the twentieth century, and according to local legend, was also known as a frequent haunt of young lovers seeking solitude, who would go on “long walks” around the area. The North Pole is now the property of the City of Reykjavik, and has been in storage for years while its exterior has been thoroughly renovated. The small timber house will soon be fully restored back to its original splendour, after which a suitable nearby place will no doubt be found for it; it, too, will offer dining options to hungry travellers. All modes of transportation require fuel of some sort, and, in 1912, a cistern for horses was constructed at Hlemmur. Due to the horse’s ubiquity in all human transport at the time, the cistern was akin to the petrol stations of today, in terms of its central role in the fledgling city. Today, a sculpture can be seen in the easternmost corner of the square; Sigurjón Ólafsson’s “The Pack Horse” (Klyfjahesturinn) commemorates both the noble beasts that served as Iceland’s tenuous transportation network in days gone by, and Hlemmur’s vital place in that network. Later, once the arrival of the automobile had replaced the horse as Reykjavik’s primary beast of burden and rendered the cistern obsolete, British Petroleum would construct a petrol station by Hlemmur, although it is of course long gone today, much like the cisterns it replaced. Hlemmur would form the jump-off point for the city’s eastward expansion. As Reykjavik sprawled out into the surrounding hills and its population grew, so did the demand for public transport, and October 1931 saw the inauguration of the city’s first motorized bus. Route 1 terminated at Hlemmur, while Lækjartorg square, less than a mile away, served as the central terminal. At the time, the neighborhood near Hlemmur was dominated by auto repair shops and car dealerships, while the taxi company Hreyfill (still in operation today) owned and ran a taxi rank and dispatch centre from the square itself. Hlemmur was in many ways the birthplace of Reykjavik car culture, its adjacent buildings servicing and selling a seemingly never-ending stream of automobiles. The car and its accompanying lifestyle had a major impact on Reykjavik city planning, not to mention its culture, and served to bolster the city’s rapid eastward growth over the next few decades. Reykjavik’s path to automobile dependency was further cemented by the city planning initiatives of the 1960s. The “car town” that sprung up around post-war Hlemmur is now gradually relocating further east, further into Reykjavik’s modern suburbia. A gasworks stood on the north side of the square for the better part of the mid-twentieth century, where the Reykjavik Metropolitan Police is currently headquartered. The gasworks opened in 1910, and remained in operation until it was closed down in the 1950s. All that remains of it today is the office and residence of the plant supervisor, now a centre for innovation. In the early 1970s, the decision was made to move Reykjavik’s central bus terminal to Hlemmur. Architect Gunnar Hansson was hired to design the new building, which he finished in 1974. Construction was completed shortly thereafter, and the new terminal was opened to the public in 1978. Today, nearly four decades after the fact, there are perhaps few who are still aware of the building’s unique place in Reykjavik’s architectural history. There are even voices calling for its demolition. The above opinion refers to Hlemmur’s erstwhile status as an indoor market, one housing a variety of retailers and their wares. 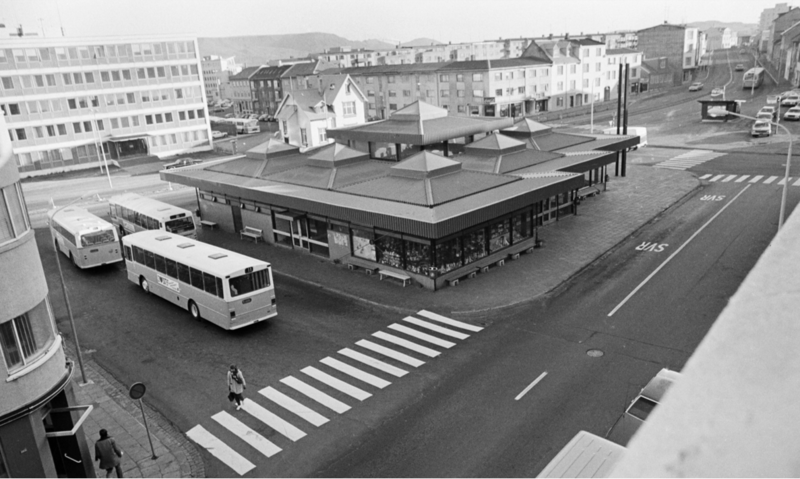 When the building first opened in 1978 under the official name “Áningarstaðurinn Hlemmur” (“Hlemmur, the Rest Area”), it featured a florist, a jeweller, a newsagent, a toy store, an ice cream parlour and a corner store. The interior space was intended to be lush and green, with ample space dedicated to live plants in large beds, and plenty of sunlight streaming through floor-to-ceiling windows that offered unimpeded views of the surrounding city life, lending an air of community to the building. A series of errors was then visited upon the terminal, altering its central purpose; the shops were closed, the windows obscured by advertising banners, and the plants were all removed. Architect Pétur H. Ármannsson has noted that the Hlemmur terminal building was designed according to the philosophies of the “high-tech” style so prominent in the 1970s. Architecture of this variety is often characterized by the use of modular, mass-produced parts, such as steel support girders, and prodigious use of glass, all assembled on-site. The support girders are often left visible to the public, even prominently so, as is most ductwork. Hlemmur’s oversized yellow air conditioning ducts are a prime example of this design philosophy. Notable buildings in this style include the Centre Georges Pompidou in Paris’s 4th arrondissement, and of course the fallen towers of Manhattan’s World Trade Center. The above-detailed attempt to create a pint-size shopping mall in 1970s Hlemmur was a dismal failure. Hlemmur quickly evolved from a bright market square into an oppressive and grey structure, one whose aesthetic was far more defined by shadows and darkness than its designer had intended. Business was slow, and Hlemmur quickly became a gathering place for misfit youths and others living on the fringes of Icelandic society, who had few other places to turn to. Two of Iceland’s unlikeliest politicians of recent note, former Reykjavik mayor Jón Gnarr and current Pirate Party MP Birgitta Jónsdóttir, were both among those branded “Hlemmers” in their time. Ólafur Sveinsson’s outstanding 2002 documentary, simply titled “Hlemmur”, offered unique glimpses into the stories of those who found within Hlemmur’s walls a sorely needed sense of belonging and consistency, something their own lives had failed to provide them with. 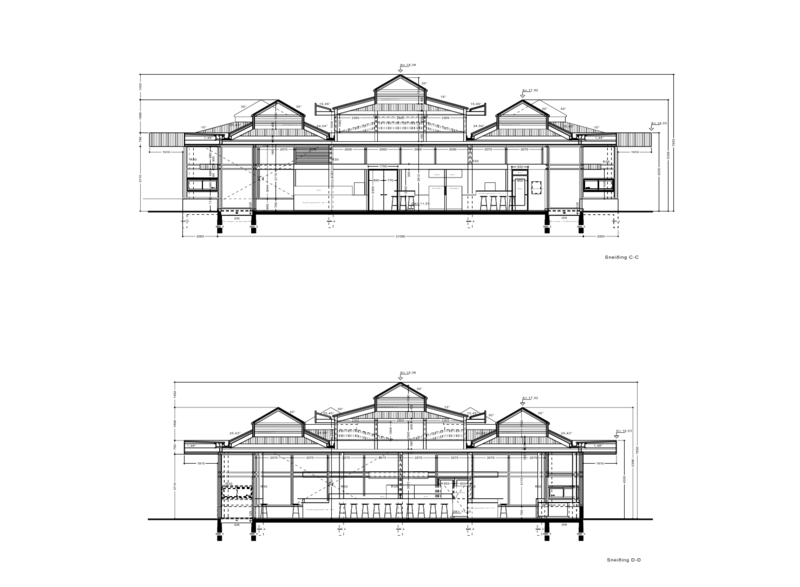 Hlemmur’s recent transformation into the aforementioned food hall heralds a return to prominence for the original building’s defining characteristics, thereby allowing for better appreciation of its architecture and aesthetic design. This is more in line with the architect’s original intent: that Hlemmur be a well-lit indoor market in a city whose weather does not permit much in the way of outdoor activities. 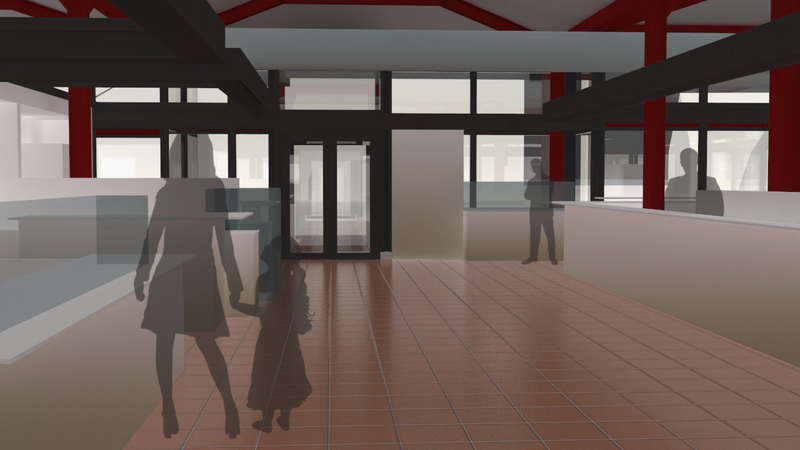 Architect Helga Gunnarsdóttir, Gunnar Hansson’s daughter, was in charge of the terminal’s redesign and renovation. The exposed burgundy steelwork that forms the building’s primary support system and the oversized air ducts are still a prominent feature, albeit with new coats of blue-grey paint, as are the building’s characteristic maroon floor tiles. 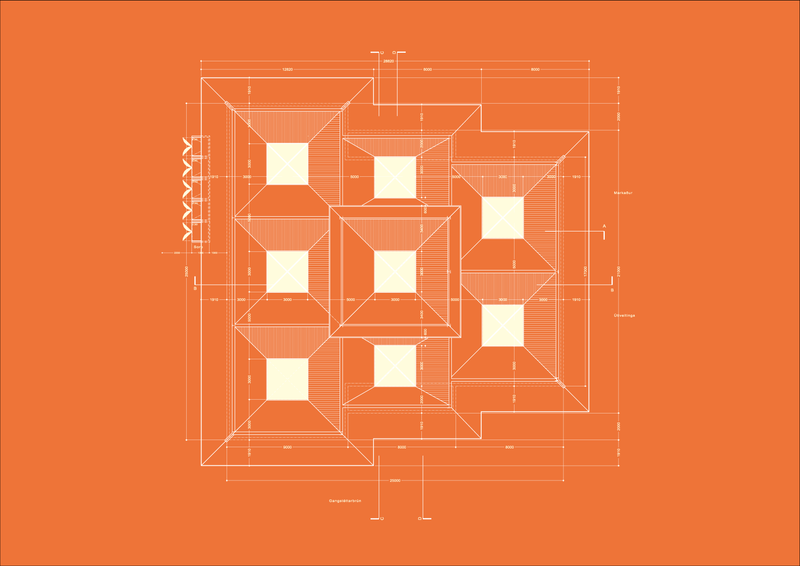 This restores an important symmetry to Hlemmur’s layout, design, and functionality. Daylight illuminates the space again, turning Hlemmur into an enclosed market square, deftly marrying its indoor practicality to its outdoor sensibility. 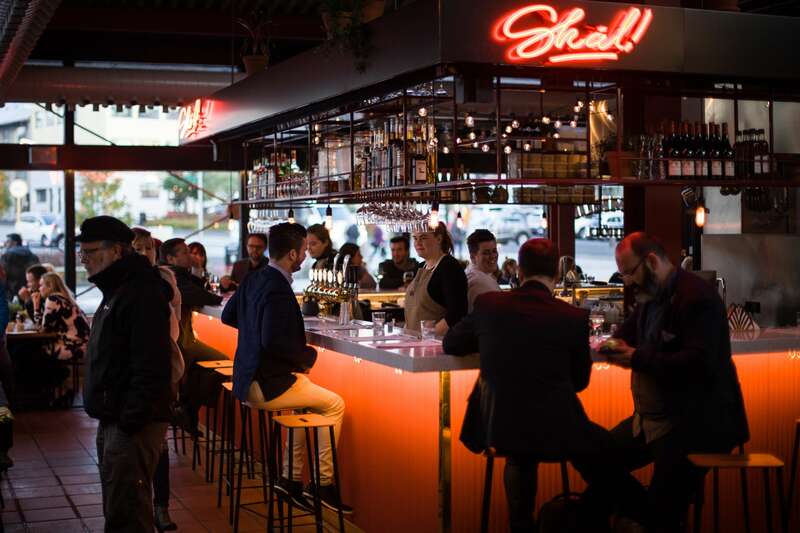 To fulfil its new role as a food hall, Hlemmur is now open 24 hours a day, and plays host to ten separate businesses, all of them permanent fixtures. Those visiting this new and improved bus terminal can have their choice of fresh Icelandic vegetables, herbs, spices, fruit, flowers, freshly baked sourdough bread, freshly roasted coffee, ice cream, candy and fresh meat, in addition to both Vietnamese and Mexican street food, to name but a few of the snacks, refreshments, pastries and beverages that Hlemmur has to offer. Icelandic ingredients and traditions are the inspirational basis behind these new ventures, although care is also being taken to lend the new space a cosmopolitan and international feel. To further bolster its vibrant new role, Hlemmur hosts a series of pop-up markets, most prominently on weekends and during the holiday season, and a year-round programme of food-related events has been drawn up. Now, Hlemmur is more than just a bus stop and transport centre; it is a destination in its own right for all those seeking to eat, socialize, or simply experience the city’s urban culture. Hlemmur forms part of Reykjavik’s development and transport axis, as defined by Reykjavik’s municipal plan. In spite of this, plans to relocate Reykjavik’s central city bus hub to the nearby national bus terminal (BSÍ) are already on the table, leaving Hlemmur free to evolve into a locale better suited to pedestrian traffic and vibrant city life. 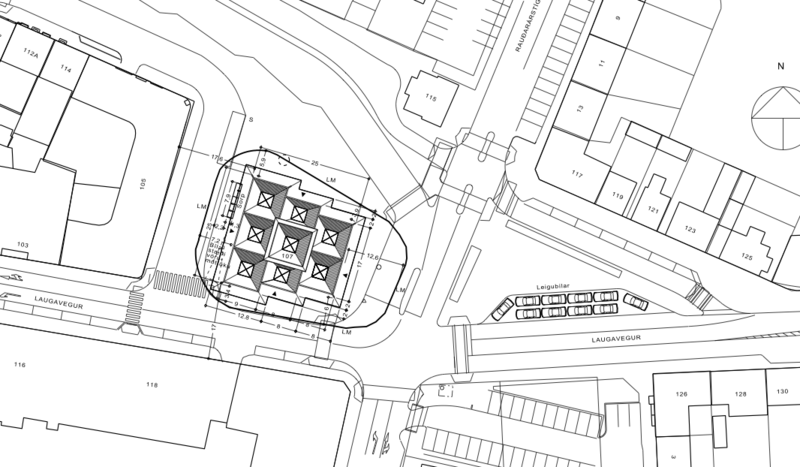 The area surrounding Hlemmur will see radical changes in the coming years, and with any luck, the simultaneous development of nearby blocks and complete renovation of central Reykjavik thoroughfare Hverfisgata will serve to better connect Hlemmur to the city centre. There is also much of gustatory note happening around Hlemmur. Nearby newcomer Krydd & Tehúsið offers a variety of teas, herbs, and spices unparalleled in all of Iceland. 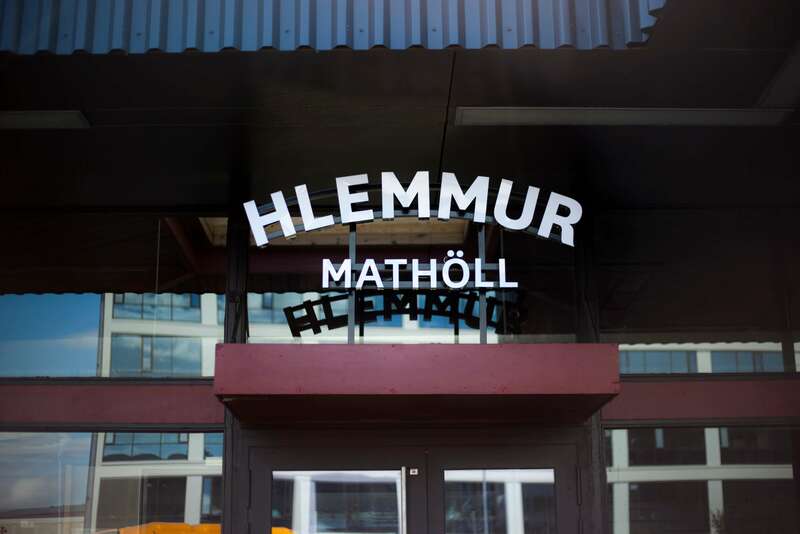 The opening of Hlemmur food hall is a major factor in central Reykjavik’s ongoing facelift and marks the beginning of, a new chapter in its long and compelling history. Jón Guðmundsson, Reykjavik City Museum, and Trípólí Architects contributed to this article. Author : Bjarki Vigfússon / Photos: Hlemmur Mathöll, Reykjavík City, Tripóli Architects.